Ashampoo slideshow Studio is one of the best professional slideshow software that turns your images into vibrant slideshows with amazing effects. The tool is dedicatedly designed to help you achieve your desired results through its numerous templates, transitions and effects that allow you explore your creativity and put it with the best of efforts. Ashampoo Slideshow Studio HD 4 provides you with a lot of new content and attain great speed with your PC resources like NVIDIA or Intel graphics cards. You can simply download the tool for free as it requires no expert to let your try your hands on it. If you’re looking for a feature rich slideshow software, Wondershare DVD Slideshow Builder is the perfect choice. The tool lets you create a photo slideshow with a combination of video and audio. You can also put 2D and 3D transition effects on your slideshow project. The tool is good to go for your professional as well as personal usage. Once you’re done building your slideshow, DVD Slideshow Builder allows you to immediately share the file over YouTube, TV and iPod. Filmora needs no introduction as it is one of the best free photo slideshow software for Windows. Though it is popular as a video maker, slideshow making is its a key feature that helps you create your photo slideshow easily. With over 300 effects and 20 plus copyright music, Filmora is a feature rich software to go with your photos. The software offers easy media uploading and intuitive interface that requires a little knowledge to begin with. Windows Movie Maker is generally provided with your machine that helps you put your photos in a slideshow. The tool is popular for a feature that lets you directly grab a video from your webcam and merge it into the slideshow. Windows Movie Maker is a handy tool that is lightweight on machine and offers a large collection of filters. Freemake Video Converter is one of the fastest photo slideshow software for Windows that arranges all your favorite videos and photos in slideshow in no time. It is useful when you’ve large multiple files while making a slideshow. The tool comes for free and also lets you directly upload the project on YouTube. Also, you can have your slideshow transferred to DVDs in no time. If you’re not looking for anything fancy, Photo Story should be your choice as a slideshow software for Windows. Photo Story is a product from Microsoft that is absolutely light on your machine and doesn’t use much of machine resources. It is rich when it comes to features and transition effects. Photo Story is very intuitive and handy to use that doesn’t require you to be a tech savvy. Overall, Internet is filled with a plethora of photo slideshow tools that you can choose for you. 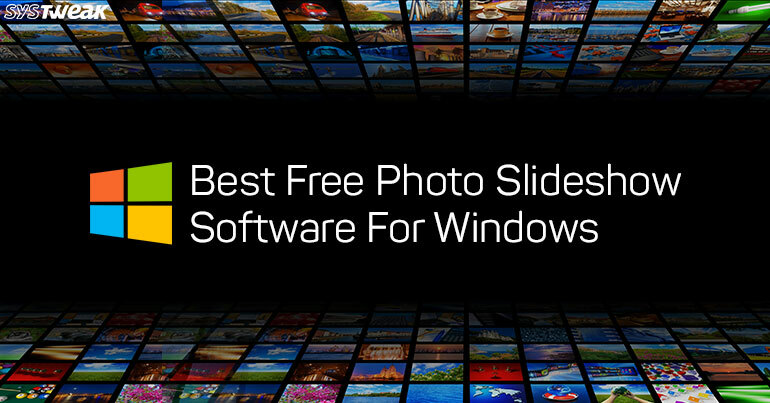 However, we bring to you best photo slideshow software for Windows, which are tested and proven to be best among the peers. You can create your own digital slideshow and play it on various platforms including digital album and YouTube.